Your data is secure with OptimumHQ. We are HIPAA and SOC 2 Compliant. Business associates, which are people and companies who provide services for and on behalf of covered entities. HIPAA-compliant business associates ensure security and privacy of any PHI that is stored, transmitted, or otherwise processed. OptimumHQ's security policies and procedures have met the security requirements to be HIPAA Compliant. Disclaimer: While OptimumHQ enables secure data storage, users are still ultimately responsible for the implementation of their own data to comply with HIPAA standards. SOC 2 reports provide detail reporting and testing procedures for third parties to evaluate. OptimumHQ's security measures have been evaluated by third party certification company Lazarus Alliance. 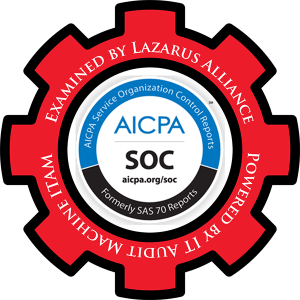 Lazarus Alliance performs regular scanning and testing to ensure the OptimumHQ system remains compliant. By utilizing a third-party certification body like Lazarus, users can rest assured knowing that OptimumHQ is not only compliant, but certified compliant. In addition to Lazarus' regular audits, scanning, and testing, OptimumHQ also has monthly meetings with their team to discuss any issues regarding security and updates. Penetration testing to find malicious code as well as the absence of functionality that may lead to security breaches are also conducted regularly.